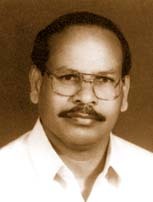 Post Graduate; Son of Shri V. Velu; born on 24 April 1946; Wife : Dr. K.M. Sukrutha Latha; 2 Sons. Chairman, Committee on Subordinate Legislation (1980-82), Committee on Environment (1996-98). State General Secretary & President, P.Y.F. ; Member, R.S.P. State Secretariat and Central Committee; President, UTUC, Travancore Devaswom Employees Union, Construction Workers Union, Matsya Thozhilali Union; Participated in the Asian Trade Conference at China 1991. Address : Anaswara, Civil Line, Alapuzha.